Batu Caves are a group of limestone caves and one of the most popular tourist destinations in Malaysia. Chitra Srikrishna explores. ‘Just a few more to go, you’re almost here!” My husband encourages me as I gasp for breath on step 200! I can see that our two daughters, already at the top, are impatient to proceed into the caves. We are at the Batu caves just outside Kuala Lumpur, Malaysia. Finally, with only one more short stop for catching my breath, I make it over the last step and am at the top. In front of me is the Cathedral or Temple Cave. The word cavernous takes a whole new meaning as I try to take in the sheer size of the natural cave. There’s a damp, pungent smell inside. Despite the early evening, the corners of the cave are already getting dark. Long stalactites protruding from the ceiling and stalagmites rising from the ground form bizarre patterns. Out of the corner of my eye I espy a huge bat heading for me straight at great speed. Instinctively I duck and it sails just past my head. Monkeys with unusually long tails are running across the alcoves chattering like magpies all the time. I feel a little awed and stand staring at the surrealistic scene of a South Indian temple with its pyramidal roof painted in bright colours inside the cave’s Martian landscape. My reverie is broken by my daughters pulling on my hands. They are anxious to explore further. As dusk hastens they want to make best of the light still coming through the natural openings in the cave’s distant roof. We hurry across to a short flight of stairs at the far end of the cave to get to the main shrine. The Batu Caves are a group of limestone caves and cave temples and one of the most popular tourist destinations in Malaysia. The name Batu comes from the name of the river that flows past the hill. The caves which are 13 km north of Kuala Lumpur are believed to have been discovered by an Indian trader, K Thamboosamy Pillai in the late 1800s. The main draw of the Batu caves is a shrine of the Hindu God Murugan (Kartikeya or Subramanya). 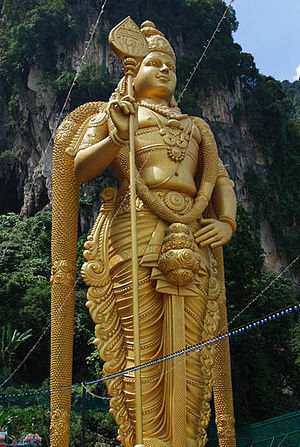 At the base of the caves a giant golden statue of Murugan, holding his weapon the vel (spear), greets visitors. The Batu caves also offer adventure to motivated spelunkers — prior permission is required to explore the Dark Cave (just below the Cathedral Cave), which is otherwise closed to the public. As we stand in the temple watching a priest complete his rituals, I am struck by the rapid conversation he engages in Tamil with another family. I would have lingered on but my husband shepherds me towards the exit. “It’s going to rain; we need to head back.” Soon enough as we begin our descent down the long flight of steps, the torrential downpour takes us by surprise. My husband and daughters being more agile quickly get to the bottom of the nearly 300 steps. Ever the careful one, I gingerly put my feet onto every step valiantly holding on to a temperamental umbrella. I remember the cab driver’s words on our way here from the hotel. “It can get slippery on the steps, especially when it rains — be careful!” We quickly clamber into our waiting cab. I remark that there aren’t too many visitors now. “You’re lucky — it’s closing time. You must visit during thaipoosam, hardly any room to stand!” Our driver is in an expansive mood. He tells us that during the Thaipoosam festival in January the atmosphere reaches a frenzy as devotees carry milk offerings for Lord Murugan in containers or kavadis (carriers) on their shoulders and climb the steps watched by a million others. Some of these carriers are extremely heavy and ornately decorated with peacock feathers and flowers. For the devotees, it’s a sacred mission. I cannot help admire them and the wondrous panorama that the Batu caves offers. If you see me on the Stairmaster machine, you know I’m preparing for my next trek up those 272 steps!